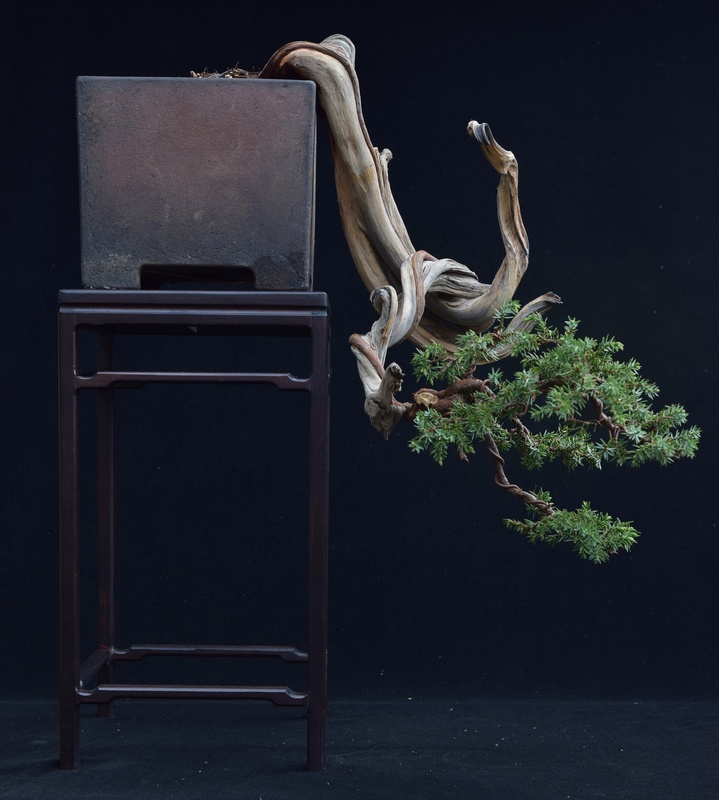 I collected this Common Juniper (Juniperus Communis) 10 years ago and today it had its first styling. 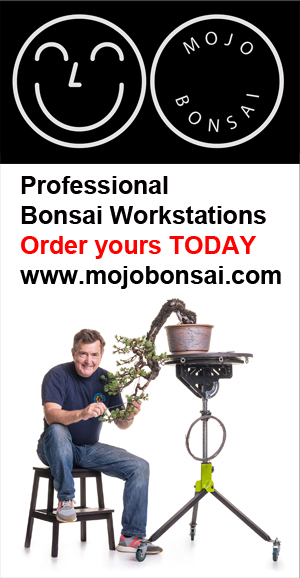 The trees are VERY difficult to collect, establish and style, so much so that most collectors simply do not dig them as yamadori as the survival rate is so low. I learnt from Peter Thali in Switzerland that the only way to collect these successfully was from a particular rock type and a short window in the year. I collected this single tree as per his advice and the tree has thrived. 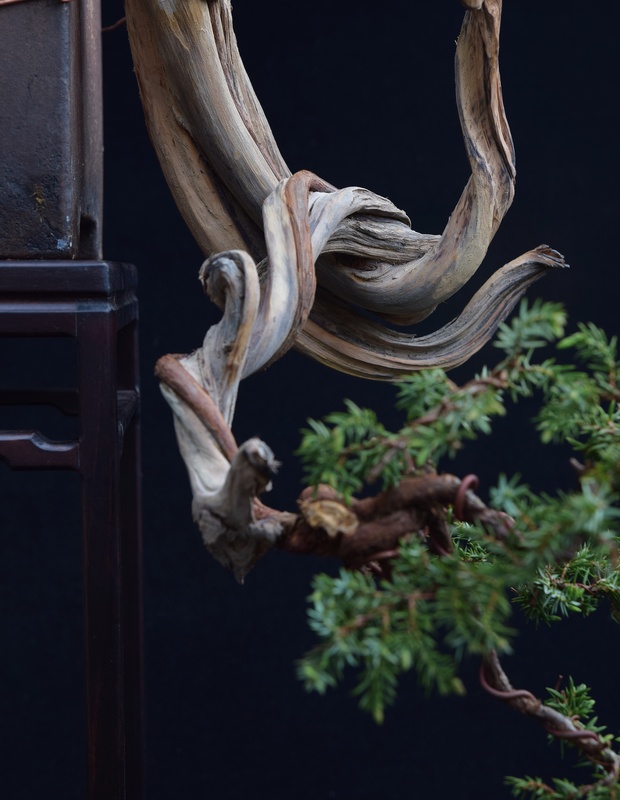 Styling Juniperus Communis is notoriously difficult as you cannot wire any new growth, wire can only be applied to branches that have bark, this gives a first styling that can look somewhat untidy as you can see… but the framework is there. I love the thin live vein and the twisting around the deadwood, the foliage will fill out but this will be done with scissors and NOT pinching. The lovely Duffet pot is only temporary until I find a suitable pot. NO carving by machine has been done on this tree, all the deadwood has been worked by hand stripping and burning the flaky ends. great tree Tony – what is your secret to keep a communist alive? I have had severals but each time I repot them – they die though I’m carefull with the roots? Nice one Mr. T! Outstanding work on the deadwood as usual!